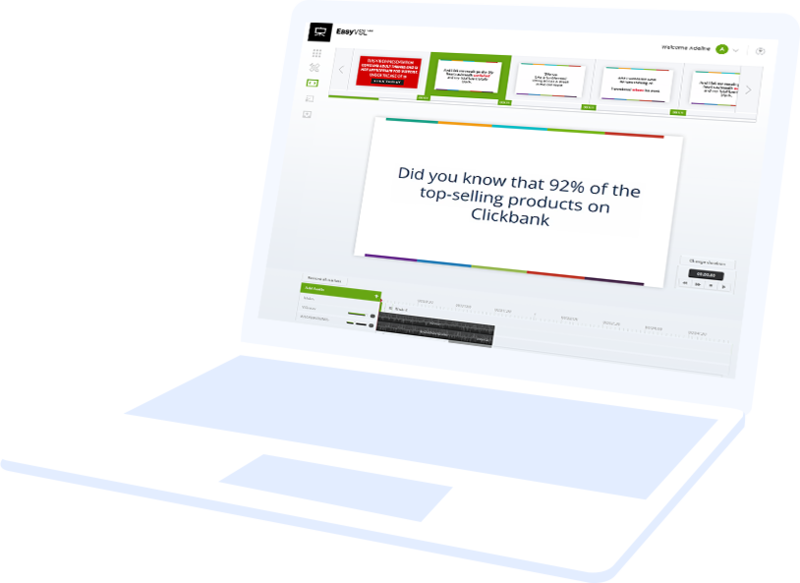 Create High-Converting Slideshow and Explainer Videos in Seconds! Professional, High-Converting Videos in Seconds! 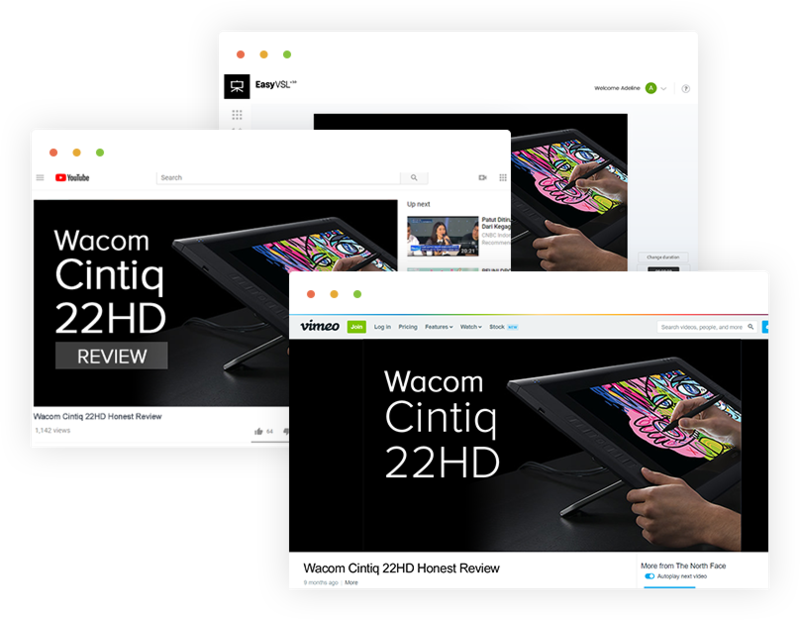 No longer will you be forced to pay outrageous fees, and wait weeks to months for professional designers and videographers to create your videos. You’ll be able to create your own with little, to no design or technical skills. And not only that, but you’ll be able to create your videos in seconds…not weeks, using ONE tool. The end-result can be even better than what the professionals deliver! Want to see just how fast it is to create a Video with EasyVSL? Just select a video style. Upload your script and voice-over. 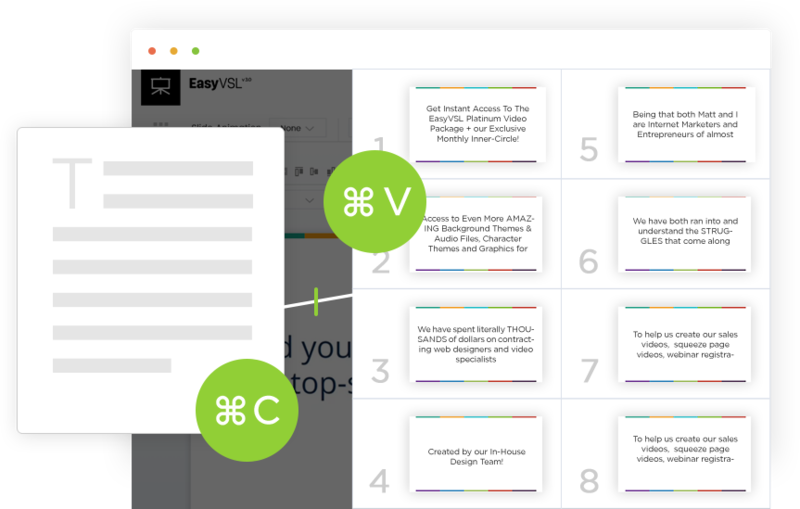 EasyVSL will automatically build out your entire video presentation. It couldn’t be any easier. 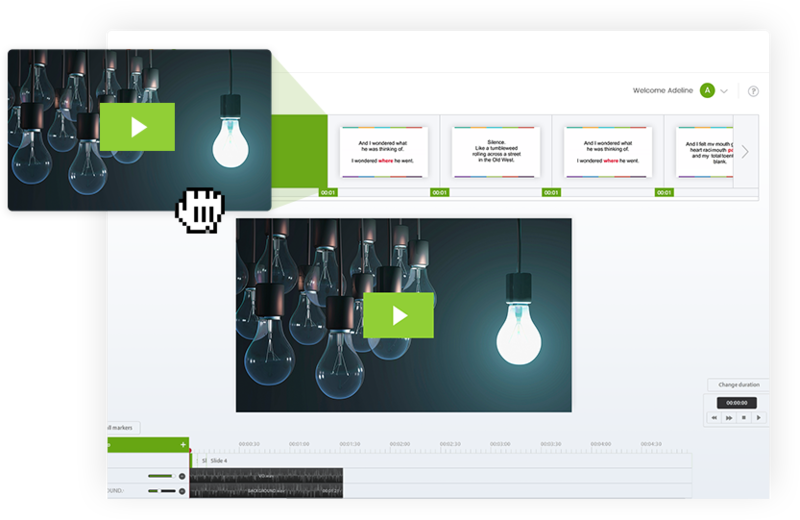 Paste in your video script and let EasyVSL generate your slide presentation for you automatically, eliminating the need to manually enter content slide by slide. 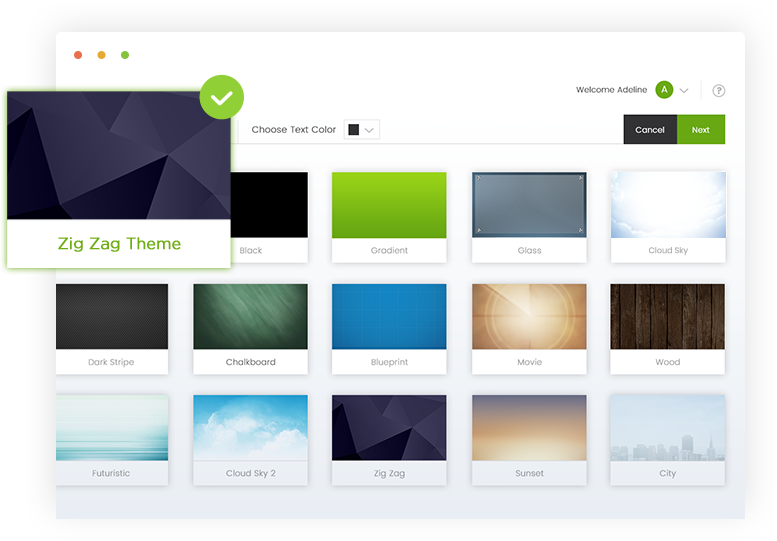 Pick a color, gradient, background image, or custom layout, and get a gorgeous background for your presentation in just seconds. Now with a Library of Over 75 Templates. Allows you to automatically and accurately sync your voice-over with your presentation slides, with just one-click. This is perfect if you’re wanting to insert a demo of your product, in-front of the camera video, or any video you can dream up. 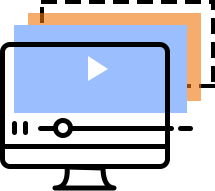 Just click and drag the video clip from your desktop into the EasyVSL editor and mix-n-match various videos with your presentation. Don’t want to record your own voiceover? Not a problem! 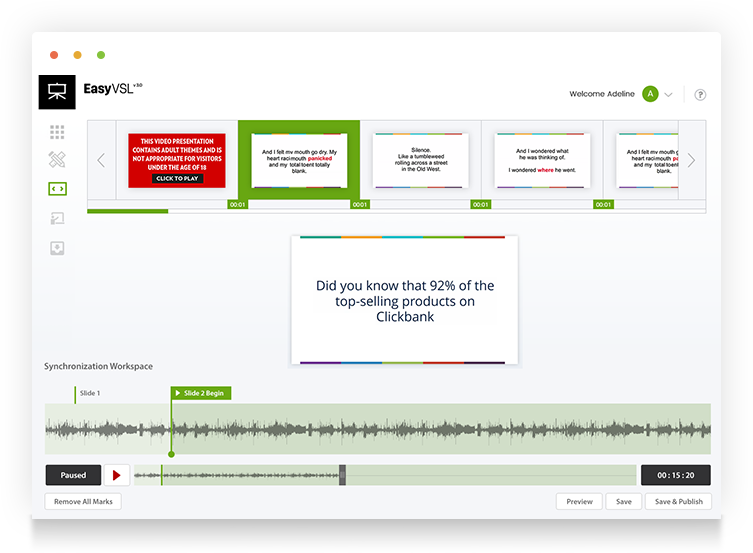 Choose one of our natural sounding voices to read the text on each of your slides, creating an audio file that can be used for your EasyVSL video. Now you can also create explainer style videos with flashy animations and effects. Choose from a massive library of royalty free graphics. 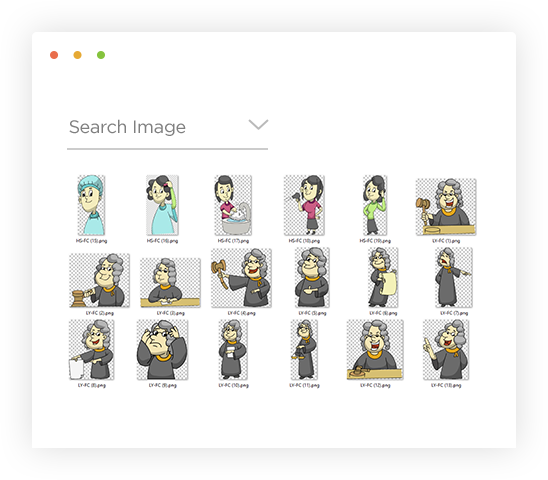 Get instant access to over 1,000,000 royalty free images/graphics directly from inside EasyVSL, for an easy way to enhance your videos. Multi-Layer Now you can add/import multiple audio and video layers directly inside of the timeline. Easily adjust the volume level inside the timeline, without having to use a 3rd party audio editing program. Marketing to several different countries? 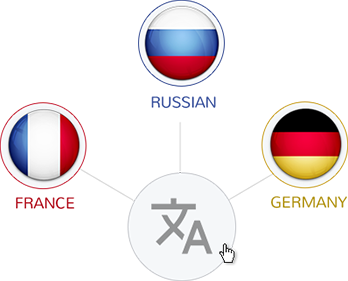 Instantly translate your text using our built-in translation tool. In just a few minutes, you can create multiple videos, specific to the language of your choice! Once your video is created, now it’s time to share it with the masses. Now you publish your videos to popular video sites like YouTube, Vimeo, and many others from directly inside EasyVSL. Install EasyVSL on multiple computers. While most software only allows one or two installs. 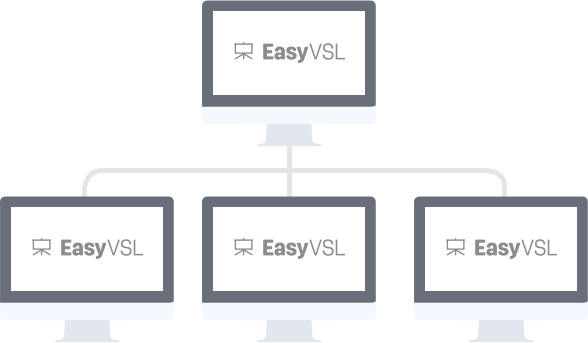 With EasyVSL, you’ll be able to download and install it on up to 5 computers. EasyVSL is both PC and Mac compatible. After you order, you’ll be directed straight to the download page. You’ll also be emailed download instructions so you can easily install it on additional computers you might own. After you’ve created your custom video in a few minutes, you’ll be able to export your video in various qualities. 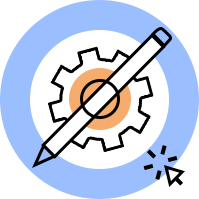 We’re continuously updating EasyVSL with bigger and better features and functionality. 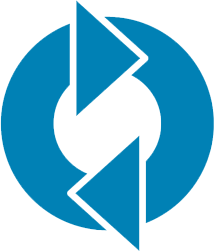 Once you own EasyVSL, we work extremely hard to release regular software updates with brand new features that we come up with, as well as requests that our brilliant EasyVSL community submits. We’re continuously updating EasyVSL with bigger and better features and functionality. Based on the daily feedback we get from community of users, we’re constantly releasing updates to EasyVSL with additional features. And you’ll get every update, absolutely free of charge! EasyVSL videos are typically the highest converting video type available, which is why professionals can demand $1000s of dollars for a single VSL. They work perfectly if you’re selling a digital product such as an online course, an eBook, a software product, or a membership website. 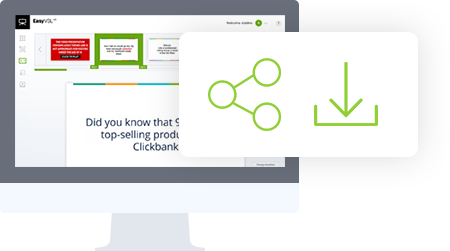 EasyVSL videos are also the perfect choice for explaining and selling eCommerce products on your website (or on Amazon). 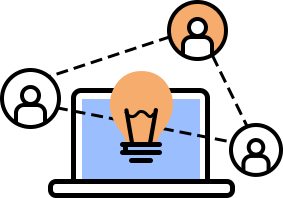 Not only does EasyVSL make it easy, but your viewers will retain more of what you’re teaching because they’re not only listening and reading, but they are also able to learn by watching. By using all 3 modalities at once, the end result is exponentially better for everyone involved. The biggest ranking factors on YouTube™ are engagement signals such as likes, shares, and time that a user watches a video. EasyVSL videos can help rank higher in search results because of that. So by simply utilizing VSL style videos and being able to create them quickly, you’re able to build large numbers of videos for more engagement and SEO ranking. If you’re looking to create a Facebook™ ad that will stop someone from scrolling and pay attention to you, our kinetic explainer style videos are proven to be an extremely engaging form of video. 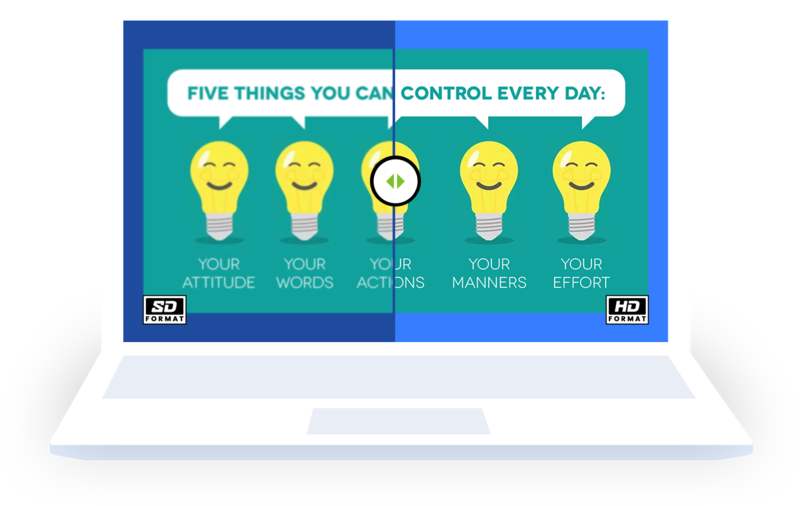 Given that these videos provide a boost in engagement and interaction, Facebook™ recognizes that and can show your ads more often at lower ad costs. Don’t have a product? No problem. Many of our members are affiliates, meaning they earn a referral commission when they promote someone else’s product and that person purchases through their affiliate link. VSLs are a great at creating “review-style” videos, breaking down the features/benefits of the product. For Any Industry and Niche in Minutes. EasyVSL Is More Than Just A Software. It’s Also a Community Of Over 40,000+ Like-Minded, Creative People, Looking To Make The World A Better, Happier Place. "I have been using Easy VSL for the last few months without telling anyone. I use ScriptDoll to write my VSL and then put the text in, and it outputs right into Easy VSL. Everyone thinks I've just better at putting together VSLs but the real secret for me and the ScriptDoll team is Easy VSL. I can't get over how easy it is to crank out a VSL now that I have this software. "VSLs have helped me in several of my niche websites over the past few years to triple the earnings per visitor from several different offers. This has resulted in easily an extra million dollars or more (it’s hard to measure precisely due to other factors, but the impact has been HUGE). EasyVSL puts VSL making on steroids making it 10x easier than ever before with their push button software. Highly recommended." We used the original Easy VSL a lot... It's always been simple to use and you can crank out very professional looking videos with all the bells and whistles pretty much on your first go - V2 takes it up another notch! So Go Ahead and Get Your Copy of EasyVSL Today! If you are not completely satisfied with your purchase within 30 days of buying EasyVSL, we will refund 100% of your money, no questions asked. Just email us at support@easyvsl.com and every penny will be gladly refunded to you within the first 30 days. Nothing could be more fair than that. 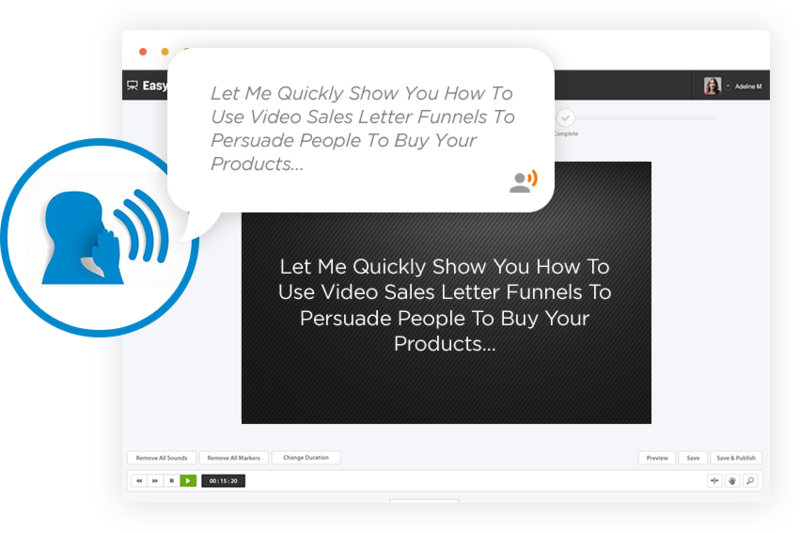 EasyVSL has become the most recognized software for creating high-converting, video sales letters in less than 60 seconds. In v3.0, now enjoyed enhanced flagship features plus newly released functionality to make VSL creation even easier than every before. This site is not a part of the Facebook™ website or Facebook INC. Additionally, this site is NOT endorsed by Facebook™ in ANY WAY. Facebook is a trademark of Facebook INC. You understand this to be an expression of opinions and not professional advice. You are solely responsible for the use of any content and hold Digital Kickstart, LLC and all members and affiliates harmless in any event or claim. You can also safely assume that I get paid anytime you click on a link on this site. We recommend that you do your own Independent research before purchasing anything.